We spent the day in the garden, making a new bed for the artichoke plants (bareroot) that we got at Sparetime supply in Willits on Saturday, and mulching the paths with rice hulls. 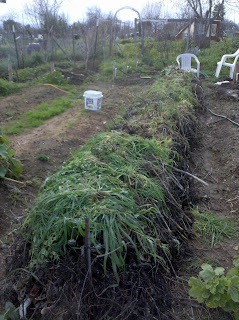 The picture here is of our compost windrow. Our compost is a mix of last years plant matter, weeds, and kitchen scraps. We saw our friends Mike and Sandrine enjoying the nice weather to get a little gardening in. We also saw Doug who was pruning his grapes and showed us his tulip plants starting to poke out of the ground. There is still a ton of work to do on the garden before the growing season starts, but it's still January (for a few more hours), so hopefully we can get out when the weather cooperrates again!